Renate Olie is one of the students working at the Saba Conservation Foundation as part of the RESCQ program. Below you can find a short description of what she has been doing. 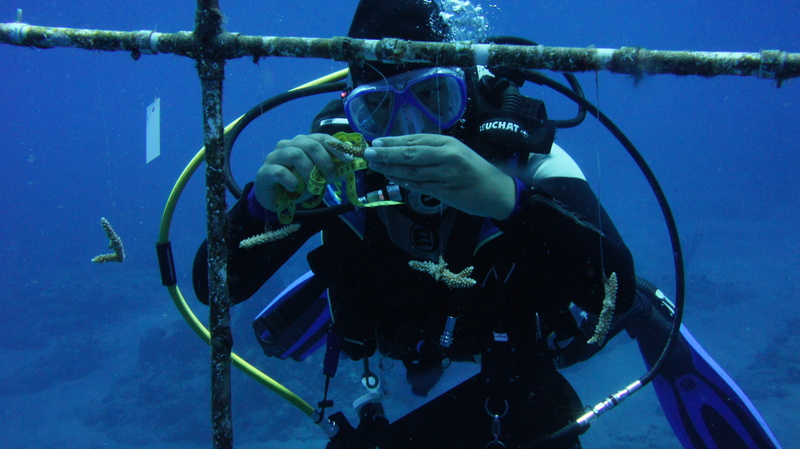 My name is Renate and I’m working on the coral nurseries of Saba. In the eleven weeks I’m here now, I’ve filled several ladders and trees with staghorn and elkhorn corals, I’ve outplanted some of the older fragments, moved a tree and measured the fragments and their ‘mothercolonies’ every month. Also cleaning of the trees and corals is part of the job. But… I could not have done this without help from staff members of the Saba Conservation Foundation, the other intern Amber Mulder and volunteers! I hope more interns will continue my work soon, because there is so much more to do! This website has been produced with the financial assistance of the European Union through the BEST 2.0 Programme. The contents of this website are the sole responsibility of IMARES, Wageningen University and Research, and can under no circumstances be regarded as reflecting the position of the European Union.